I decided to re-join Audible after a six-year absence after my positive experiences with audiobooks in my daily commute to work. I am learning the narrator (as expected) makes a big difference. The style of writing also is important. I have found a few books and narrators that I just cannot follow listening to them. Redshirts by John Scalzi is narrated by Wil Wheaton of Star Trek fame, and he does a good job with what he has. 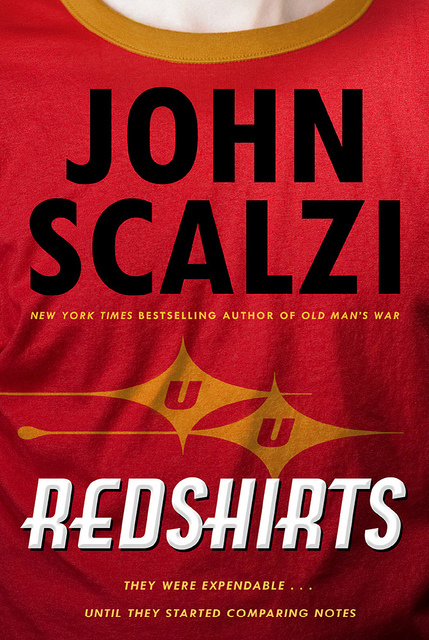 Red Shirts by John Scalzi is a novel based on the old adage in Star Trek that red shirted security guards are fated to die in away missions. This is an old joke and has been done many times in the community. This is Scalzi’s attempt at it. He succeeds marginally in my opinion. It is an amusing book for a bit. However, like a SNL skit, this book just goes on way too long. His idea was cute, and maybe even clever, for a novella or novellete, but this idea wears itself very thin for in 320 pages or 8 hours in my audiobook. This book is not awful, but he doesn’t give enough for the length that it is, and it would have worked even better if he were able to write it in the Star Trek universe, but I understand why he wasn’t able to do that. The other issue I had with this book is the writing. I have never read Scalzi (and in all truth still haven’t as I listened to this), and after this first encounter, I can’t say I am impressed. Most of this book is dialogue, very little character development or even world-buidling. Part of it due to the subject matter. This is a comic novel, so I am able to forgive a lot of that list, but the writing. I don’t know if I would have caught this if I had read it, but I think I would have. Scalzi needs to work on his dialogue. I have never heard the word “said” more than in this book. After every sentence spoke by a crew member is the word said. This needs to happen sometimes, but there are many ways to structure dialogue that this is not needed, and when you have only 2 characters you certainly don’t have to. If we were to have a drinking game whenever Will said said, we would have died of alcohol poisoning within the first chapter. I hope his other novels don’t have this issue, but this one certainly does. I will read John Scalzi again, but I must say it may be awhile after this first initial read, but I have only heard good things about his Old Man’s War universe. This entry was posted in Reading and tagged john scazli, parody, reading, sci-fi, star trek. Bookmark the permalink.